Evergreen Woods residents are continuing their criticism of trees planted in their development, even as Garden State Parkway officials say the greenery that was added to the complex is fast-growing an in line with what residents requested. Ultimately, residents of the complex have been lobbying the state for a sound wall to be installed between the highway and their community, but New Jersey Turnpike Authority officials have said the area does not qualify for a sound wall because the expansion of shoulders does not constitute an expansion of the highway itself. In a compromise, the Turnpike Authority – which has jurisdiction over the Parkway – agreed to fund the planing of several hundred trees and maintain them for two years. After the trees were planted, however, residents said they were much smaller than promised. 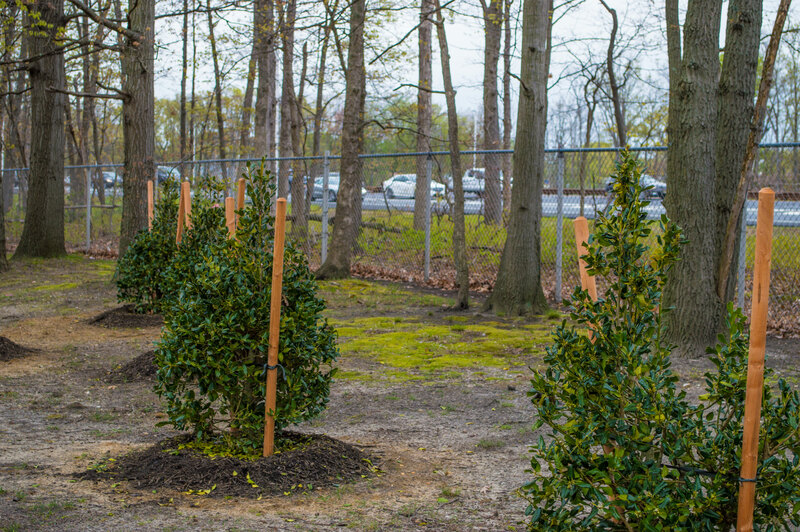 The authority, for its part, told Shorebeat and Brick officials that the trees planted were selected by Evergreen Woods’ own landscaper, and they were specifically chosen as a species that grows quickly and will provide long-term protection. “The landscaping plan was created in consultation with the homeowners’ association,” said Thomas Feeney, Turnpike Authority spokesman. Likewise, Mayor John Ducey said he has been in touch with the authority following the criticism and learned that the trees that were planted have a better chance of staying alive than a full-grown tree transplanted to the site. “A tree that is already tall has a better chance of dying off,” Ducey said he learned recently. “The type and location of the trees, the timing of the planting, and even the treatment of the soil were all based on feedback from the homeowners group,” Feeney said. Still, residents say larger trees, and a sound wall, should have been added. “They might look aesthetically fine, but they won’t stop a diesel truck from rolling off the Parkway into our children or one of the homes of our neighbors,” said john Sluka, an Evergreen Woods resident. To that end, Feeney said trees are not a substitute to a sound wall, which under the law Evergreen Woods is not entitled to. As for the trees, Feeney said the species chosen – the Leyland cypress – was chosen for its survival and rapid growth rate.